An explosion on June 7 near Moundsville, West Virginia, on the Leach XPress pipeline cut off an estimated 1.3 billion cubic feet per day (Bcf/d) of natural gas transportation capacity out of the Marcellus region. The cause of the explosion is currently under investigation by the Pipeline and Hazardous Material Safety Administration. 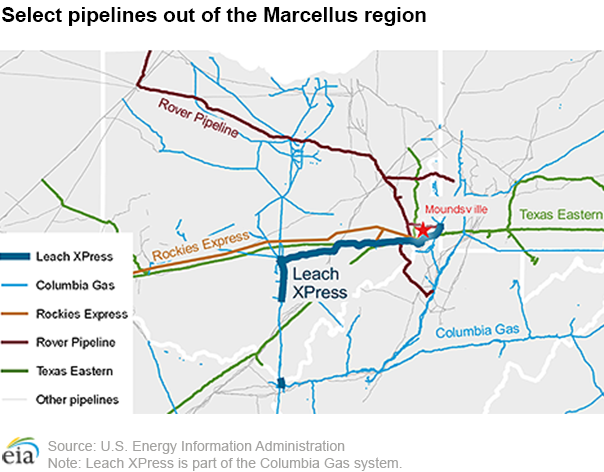 Following the incident, Columbia Gas Transmission (TCO), which operates the pipeline, issued a critical notice declaring a force majeure and announcing that there would be no flows on the Leach XPress line until further notice. The 160-mile long, 36-inch diameter Leach XPress was placed into service on January 1, 2018. 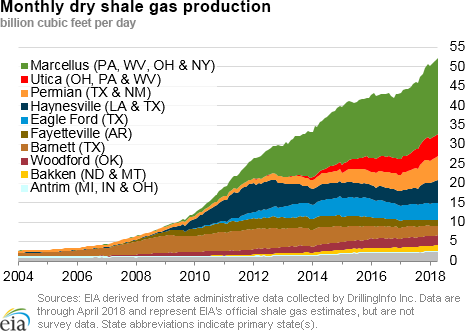 Although a reduction in pipeline takeaway capacity can affect natural gas production if supply no longer has a means of getting to market, production levels in the Northeast have so far been unaffected. PointLogic Energy estimates that dry production in Pennsylvania, Ohio, and West Virginia was essentially unchanged from June 6 to June 12, averaging a little more than 27 Bcf/d. As capacity decreased on the TCO system, flows on other pipelines in the region increased, indicating production volumes were re-routed to other pipelines. Data from PointLogic Energy indicate production receipts on the TCO system fell by 1.3 Bcf/d from June 6 to June 8. 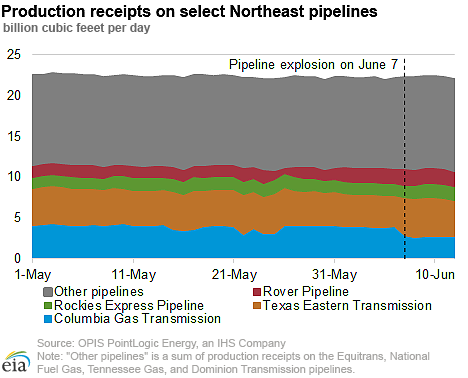 Over the same period, production receipts on Texas Eastern Pipeline (TETCO), Rockies Express Pipeline, and Rover Pipeline cumulatively rose by 1.2 Bcf/d. Most of this increase, 0.9 Bcf/d, was observed on TETCO, which flows natural gas to both the Gulf Coast and the Philadelphia and New York City areas. In the days following the event, some regional price changes were observed. Prices at Dominion South in southwestern Pennsylvania fell from $2.36 per million British thermal unit (MMBtu) on June 6 to $2.11/MMBtu on June 8. However, the price has since rebounded to $2.23/MMBtu as of June 12. Natural gas spot prices rose at most locations this report week (Wednesday, June 6 to Wednesday, June 13). The Henry Hub spot price rose from $2.85/MMBtu last Wednesday to $2.94/MMBtu yesterday. At the New York Mercantile Exchange (Nymex), the July 2018 contract price rose 7¢ from $2.896/MMBtu last Wednesday to $2.963/MMBtu yesterday. Net injections to working gas totaled 96 Bcf for the week ending June 8. 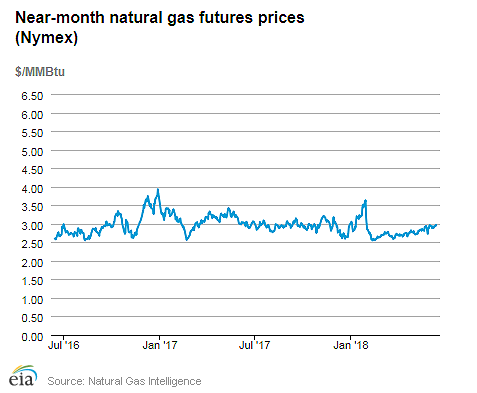 Working natural gas stocks are 1,913 Bcf, which is 29% lower than the year-ago level and 21% lower than the five-year (2013–17) average for this week. 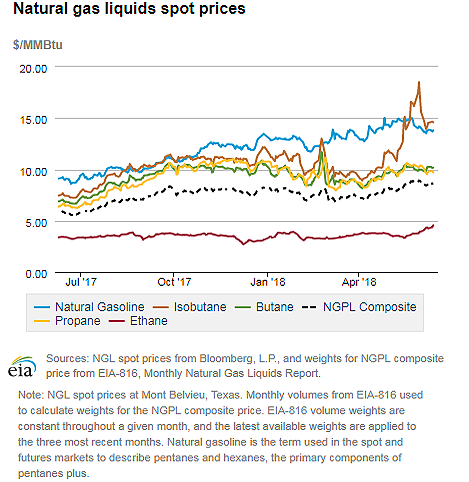 The natural gas plant liquids composite price at Mont Belvieu, Texas, fell by 3¢, averaging $8.58/MMBtu for the week ending June 13. The price of propane and isobutane fell by 3% and 4%, respectively. The price of ethane and butane rose by 7% and 3%, respectively. The price of natural gasoline remained flat week over week. 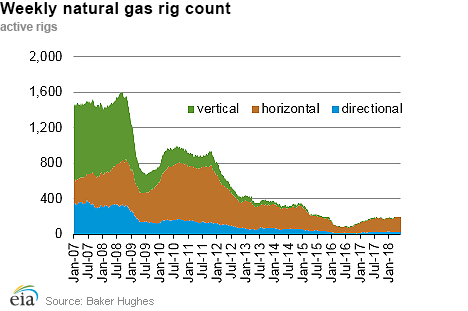 According to Baker Hughes, for the week ending Tuesday, June 5, the natural gas rig count increased by 1 to 198. The number of oil-directed rigs rose by 1 to 862. The total rig count increased by 2, and it now stands at 1,062. National benchmark spot price rises with warmer temperatures over much of the Lower 48 states. This report week (Wednesday, June 6 to Wednesday, June 13), the Henry Hub spot price for next-day delivery rose 9¢ from $2.85/MMBtu last Wednesday to $2.94/MMBtu yesterday. According to data from the National Oceanic and Atmospheric Administration (NOAA), most parts of the Lower 48 states are expected to be warmer today—by as much as 10°F (degrees Fahrenheit) in some parts of the country—compared to last Thursday. The average price for the report week increased only 2¢, from $2.88/MMBtu last report week to $2.90/MMBtu this report week. Over the entire report week, most areas of the Lower 48 states over this report week had average temperatures within a few degrees of the average temperatures last report week. Spot price at a key Midwest trading hub increases Wednesday over Wednesday but decreases on a weekly average basis. At the Chicago Citygate, prices for next-day delivery increased 6¢ from $2.67/MMBtu last Wednesday to $2.73/MMBtu yesterday. However, the average price for the report week fell slightly, from $2.70/MMBtu last report week to $2.68/MMBtu this report week. Citygate prices in California rise Wednesday over Wednesday with increased electricity demand because of warmer weather. The price for next-day delivery at SoCal Citygate increased 54¢ from $2.82/MMBtu last Wednesday to $3.36/MMBtu yesterday. According to Southern California Gas Company’s (SoCalGas) ENVOY electronic bulletin board system, the estimate for next-day delivery volumes rose 19% this Wednesday compared to last Wednesday. Prices at PG&E Citygate in Northern California rose 5¢, up from $2.95/MMBtu last Wednesday to $3.00/MMBtu yesterday. Most of California is expected to experience temperatures up to 10°F warmer today compared to last Thursday. According to EIA’s U.S. Electric System Operating Data, electric demand in the California Independent System Operator territory (CAISO) is forecast to increase 24% today compared to this time last week. Northeast prices are mixed. At the Algonquin Citygate, which serves Boston-area consumers, prices went down 1¢ from $2.51/MMBtu last Wednesday to $2.50/MMBtu yesterday. At the Transcontinental Pipeline Zone 6 trading point for New York City, prices increased 12¢ from $2.67/MMBtu last Wednesday to $2.79/MMBtu yesterday. Prices in West Texas are trading more than $1.00/MMBtu lower than the Henry Hub price. At the Waha trading hub in West Texas—which reflects the price of natural gas produced in the Permian Basin—the price for natural gas yesterday was $1.03/MMBtu lower than the price at Henry Hub. Discounted prices at Waha largely reflect growing associated-dissolved natural gas volumes from oil production in the Permian in conjunction with constrained takeaway capacity. Nymex futures rise. At the Nymex, the price of the July 2018 contract increased 7¢, from $2.896/MMBtu last Wednesday to $2.963/MMBtu yesterday. The price of the 12-month strip averaging July 2018 through June 2019 futures contracts climbed 4¢ to $2.929/MMBtu. Average week-over-week supply is flat. 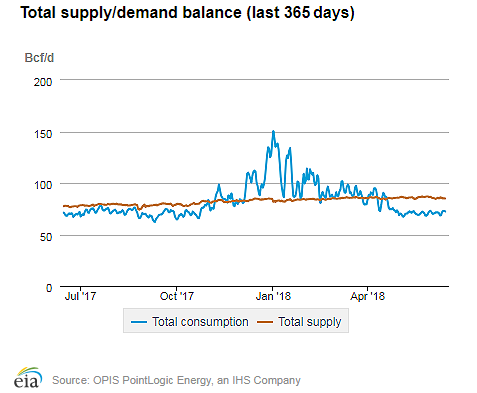 According to data from PointLogic Energy, the total supply of natural gas remained the same as in the previous report week, averaging 85.4 Bcf/d. Dry natural gas production remained constant week over week. On a regional basis, production in the Northeast, Southwest/Texas, and West regions was relatively flat, according to S&P Global Platts. Average net imports from Canada decreased by 1% from last week, according to PointLogic Energy. Week-over-week demand falls slightly, with largest declines in the residential and commercial sectors. Total U.S. consumption of natural gas fell by 1% compared with the previous report week, according to data from PointLogic Energy. Natural gas consumed for power generation was flat, averaging 29.6 Bcf/d, with much of the southeastern United States experiencing weekly average temperatures this report week similar to weekly average temperatures for last report week. Industrial sector consumption decreased by 1% week over week. In the residential and commercial sectors, consumption declined by 4%, with similar-to-warmer temperatures for much of the northeastern United States this report week compared to last report week. Natural gas exports to Mexico increased 1%. U.S. LNG exports decrease week over week. Four LNG vessels (combined LNG-carrying capacity 14.6 Bcf) departed the United States from June 7 through June 13 (all from the Sabine Pass liquefaction terminal). Corpus Christi Liquefaction LLC, a subsidiary of Cheniere Energy, the developer of the new Corpus Christi liquefaction facility in San Patricio County, Texas, has filed a request with the Federal Energy Regulatory Commission for authorization to introduce fuel gas to begin commissioning Train 1. Corpus Christi liquefaction project currently has two trains under construction. In May 2018, Cheniere Energy made a Final Investment Decision (FID) to proceed with the development of Corpus Christi Train 3. A full list of the status of U.S. liquefaction facilities is available in EIA’s new database of liquefaction facilities. Net injections rise higher than the five-year average. Net injections into storage totaled 96 Bcf for the week ending June 8, compared with the five-year (2013–17) average net injection of 91 Bcf and last year's net injections of 82 Bcf during the same week. Net injections averaged 13.7 Bcf/d. Net injections will have to average 12.6 Bcf/d for the remainder of the refill season to match the five-year average level (3,815 Bcf) by October 31. Working gas stocks totaled 1,913 Bcf, which is 507 Bcf lower than the five-year average and 785 Bcf lower than last year at this time. Despite relatively low storage inventories, the average January 2019 futures contract price trades at a lower premium to the average spot price than last year at this time. 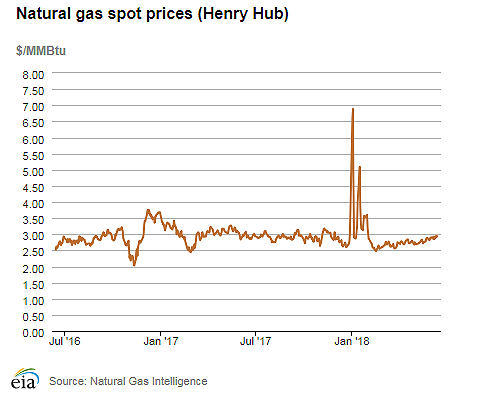 During the most recent storage week, the average natural gas spot price at the Henry Hub averaged $2.89/MMBtu while the Nymex futures price of natural gas for delivery in January 2019 averaged $3.15/MMBtu, 26¢/MMBtu higher than the spot price. A year ago, the January contract was 41¢/MMBtu higher than the spot price. Reported net injections into storage are on the high end of the range of analysts’ expections. According to The Desk survey of natural gas analysts, estimates of the weekly net change from working natural gas storage ranged from net injections of 86 Bcf to 97 Bcf, with a median estimate of 89 Bcf. At the 10:30 a.m. release of the Weekly Natural Gas Storage Report (WNGSR), the price of the Nymex futures contract for July delivery at the Henry Hub fell 3¢/MMBtu to $2.94/MMBtu, with 1,020 trades executed. Prices declined in subsequent trading, falling to $2.93/MMBtu. Temperatures are in the normal range for the storage week. Temperatures in the Lower 48 states averaged 70 degrees Fahrenheit (°F), 2°F higher than normal and 1°F higher than last year at this time.Temperatures were 1°F higher than the level reported for the previous week.